Are you ready for Hooping 3.0? Swing yourself fit with these innovative Hoopomania Arm Hoops! You certainly still know those wooden Hula Hoops from your childhood, don't you? The modern versions have become very efficient fitness tools which don't have anything in common with their "wooden ancestors", apart from the nice memories you will enjoy. Perhaps you have already discovered that Hooping is a popular fitness trend allowing you to reach your dream figure? Here we present you now the smaller sister models: the Hoopomania Arm Hoops are able to make you feel better. And it could not be easier: put on the Arm Hoops and let your body swing to the rhythm of your favorite music! These Hoopomania Arm Hoops represent a very handy kind of fitness equipment, which allows you to improve your physical fitness if you use it regularly. The arm muscles will be strengthened in particular; the shoulder will be trained effectively as well. Regular Arm Hoop exercises effectively prevent neck complaints and the whole posture will improve perceptibly. The exercises are very easy and by means of choosing your favorite background music, Arm Hooping will become a relaxing and revitalizing break from the daily stress. A new fitness trend has been arrived: Put on these Arm Hoops, get up your arms and here we go! It is recommended that you stand firm while exercising Arm Hooping. After having put on both Arm Hoops, you have to stretch out your arms horizontally and to begin with rotating movements. Let the Arm Hoops rotate on the forearms. After some days of training, you will get a good feeling of how to vary the speed and the intensity of the rotations. Now you should move your arms into different directions in order to stimulate different muscles. Please try to vary the speed, if necessary, depending on your individually selected background music. Of course you can use the Arm Hoops as well for other kinds of fitness exercise. Take one Arm Hoop in both hands and try to stretch both arms behind your back. Alternatively, you could hold one Arm Hoop above your head, stretching both arms. Now move your body slowly to the left and to the right in order to improve your coordination. You might as well include the Hoops in your Yoga exercises if you want to improve your inner self. We recommend you to intensify your workout slowly and to begin with exercises that last 2 minutes and not more. It is perfectly normal that you will feel a kind of soreness at the beginning. This only shows you that you were able to stimulate effectively different muscles. If you feel any kind of pain or strange sensation during or after the workout, you should immediately consult your doctor. If you already suffer from shoulder or neck problems, you should ask your doctor before you start your training with the Arm Hoops. You are searching for a fitness change or rather for an attractive and exciting alternative? 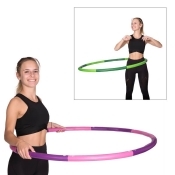 Then you should try out our innovative Hoopomania Arm Hoops: these Hoops are the perfect fitness equipment if you want to enjoy an even more dynamic workout. Test now these new handy Arm Hoops and discover a completely new dimension of dynamism for your body.